Shoulders are my absolute favorite body part to train, mainly because I can really envision the shoulders growing as I lift, and I love full, muscular shoulders on both women and men. Shoulders are what define much of a physique, especially in women’s figure competitions. They make the waist appear smaller, and add nice symmetry to your body. 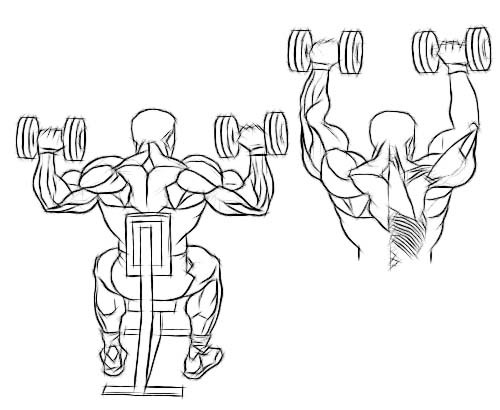 This exercise should be a part of everybody’s regimen when looking to improve size and strength to the shoulders. I prefer dumbbells but I also sometimes use the machine (where I’m able to do a bit more weight), but as always, with dumbbells you really force all the muscles to go into action. You can do these standing or seated (I prefer the latter), and you can alternate raising one arm and the other, or both at the same time. Take the dumbbells in your hand, palms facing away from you/forward and bring the dumbbells up to shoulder height. Press all the way up above your head until the touch at the top, and come back down towards the shoulder. I throw in drop sets here, where I get to really feel the burn! 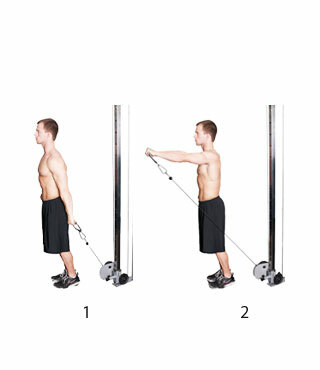 Grab a set of dumbbells and stand straight up with the dumbbells at your sides. Your palms should be facing your body. You should be holding the dumbbells slightly off your body, as this keeps the tension on the side delts. This is your starting position for the exercise. Slowly raise the dumbbells up to around shoulder height. It’s important that you do not let your wrists go above your elbows while raising the weight, as this will take the work off the side delts and put it on the front delts. Pause at the top of the movement, and then slowly lower the weight back to the starting position. Do not let the dumbbells touch your body, and then raise them for the next rep.
You can also do these with a barbell, but I enjoy the cable because you have the muscle under constant tension both going up and down. 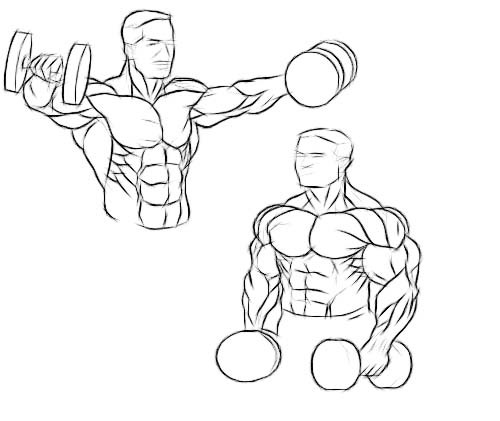 This exercise works both the biceps and the shoulders. I usually super set with the next exercise (#4 – cable front raise) and I get a good burn. This exercise has great impact on the medial head of the deltoid, many people are weak in this area so is a great one to add into your routine. Attach a straight bar to a low pulley cable machine. Select weight on the stack and stand facing the machine with your feet about shoulder width apart. Grasp the bar with an overhand grip (palms facing down), with your hands just inside shoulder width apart. Keeping the bar close to your body, let your shoulders “sag” as far as possible. This is the starting position for the exercise. Keeping your back straight and eyes facing forwards, lift the bar straight up while keeping it as close to your body as possible (pull your elbows really high up, bar should be above chest). Pause, and then slowly lower the bar back to the starting position. Attach a straight bar to a low pulley cable machine and select weight. Facing away from the machine, grab the bar with an overhand grip. Stand up straight with the bar just off your thighs, this is your starting position. Slowly raise the bar up to shoulder height while keeping your arms straight and body fixed. Pause, then slowly lower bar to the starting position. Repeat. This might be the most technical exercise of the group, and is why we don’t see it incorporated in many people’s routine. It is however a wonderful addition to your shoulder workout, and can give you great gains. Hang cleans is really an exercise that develops total body explosive strength, and develops power and and coordination in the upper body. The clean and press is a two-part movement; the first is the clean from the bar hanging at arm’s length in a standing position. The second part is the pressing up from the shoulders to an overhead position. Do this in the beginning of your workout when you’re fresh and not likely to be weak or unfocused, increasing the risk of injury. 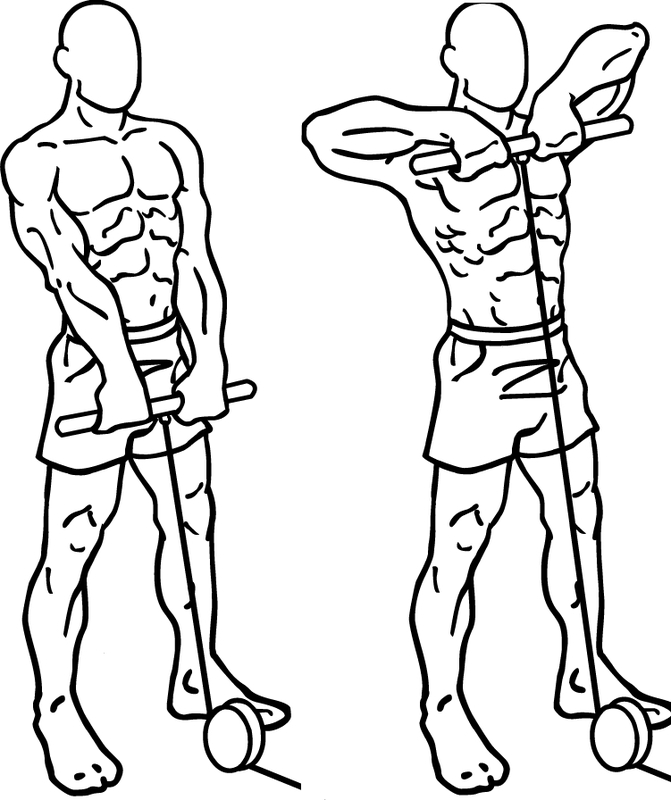 Grab a barbell with a medium grip, feet placed just a bit wider than shoulder width apart. With arms hanging down holding on to barbell, this is your start position. Knees should not be locked, legs bent a little and push your hips back a bit. Applying explosive power through thighs and calves, bring the barbell up to your shoulders by flipping your arms up and back, letting the barbell rest on your shoulders. While you’re doing this, drop your body down and flip your wrists back (very important!). The bar should go up as straight as possible (not swinging it). Finish by pressing up overhead in a military press. Lower weight back down to shoulders, then flip it back down to arms length. Repeat. This video showcases this exercise.